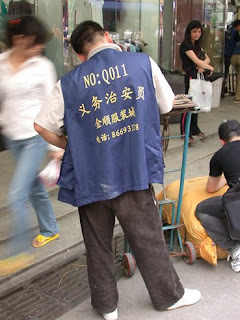 Q011 is one of a 65 strong team of porters serving the massive clothing wholesale marketplace, Zhanxi Plaza; one of dozens of wholesale zones in Guangzhou trading clothes, fabrics, electronics, shoes, gifts, toys, clocks, watches, etc, each of which has its own dedicated team. These men – mostly migrant workers from outside Guangzhou – are a vital link in the despatch of goods throughout China and worldwide. They wanted us to take photographs of them, then we asked them if we could arrange to take a photograph of all of them all together and interview them about where they came from. After permission from their manager, they agreed to gather at 8.30 one morning. When we arrived, we were unceremoniously ignored. Apparently the porters had been instructed by their manager ‘not to talk to the foreigners’ for fear of participating in something that could end up illustrating a derogatory story about China, on the front page of a western newspaper. With the Olympics coming up, we were too hot to handle.